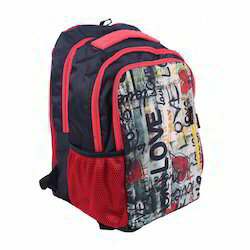 Being a quality centric firm, we are involved in offering a wide range of Boys School Bag to our precious customers. Provided bags are made using prime quality raw material in several designs. Available in various sizes and plethora of colors, these offered bags are easy to carry and available at reasonable rates. Kids school bag with various cartoon character stickers and color combinations, 2 full size and 1 small pocket with water bottle holder. Made with strong and light material with printed design on complete bag. Good cushion on sholder strap to ease the weight. - One haul loop, Two padded and adjustable shoulder straps.